I couldn’t resist the corny title. I have a date plant and several tiny dragonfruit cacti growing on the windowsill right now. As you can see, I’ve got some other plants growing there as well. There’s a small orchid plant, a spider plant cutting, a mini lavender rose bush, and lilac bush cuttings. The date plant is the one that looks like grass. It’s very slow to grow. I’ve had it for over a year now, and it is only just now growing a middle leaf. Although, one of the other leaves is drying up, so I don’t know if that’s good or not. It will probably be years before it looks like much of anything. To grow a date plant, just grab some unsulphured pitted dates from the grocery, plant the pits, and put them somewhere sunny. The pits take a long time to germinate, so don’t be discouraged if you still haven’t seen anything after a month. Make sure to plant several pits in case some of them aren’t viable. The dragonfruit cacti are doing really well. I filled half of a cardboard egg carton with cacti soil and planted seeds from a grocery store dragonfruit. There is no special procedure to follow. When you open up the fruit, you’ll see the tiny black seeds spread throughout the white flesh. Just scoop out a small amount and wipe the seeds on a paper towel to remove any residue. Plant them about half of an inch deep, water them, and put them somewhere sunny. They should come up within 1-2 weeks. I’ve also planted cherry pits. I have no idea if they will come up or not; I did put them in the fridge for a couple of months because they need “cold stratification” to germinate, but so far nothing has sprouted. Maybe I should have put them in the freezer? I don’t know. Almost one year after my original post (September 2016), the dragon fruit plants are still alive and well. They’re about 6 inches tall now, and a few of them are growing aerial roots. I did a bit of research and found out that the dragon fruit — also known as pitahaya, pitaya, and strawberry pear — is a climbing cactus. It grows in forested areas, using trees for support as it climbs up the trunk and branches and anchors itself with aerial roots. The technical term for it is “epiphyte,” which means it uses another plant for support but not for nutrients (it’s not parasitic). The botanical name is Hylocereus undatus. Out of all the cacti in the world, those belonging to the hylocereus genus produce the largest flowers. Dragon fruit, or pitaya, is native to South and Central American regions, but now it grows in most parts of the world. Surprisingly, it’s considered an invasive species in certain areas, including South Africa, Hawaii, Florida, and Cuba. 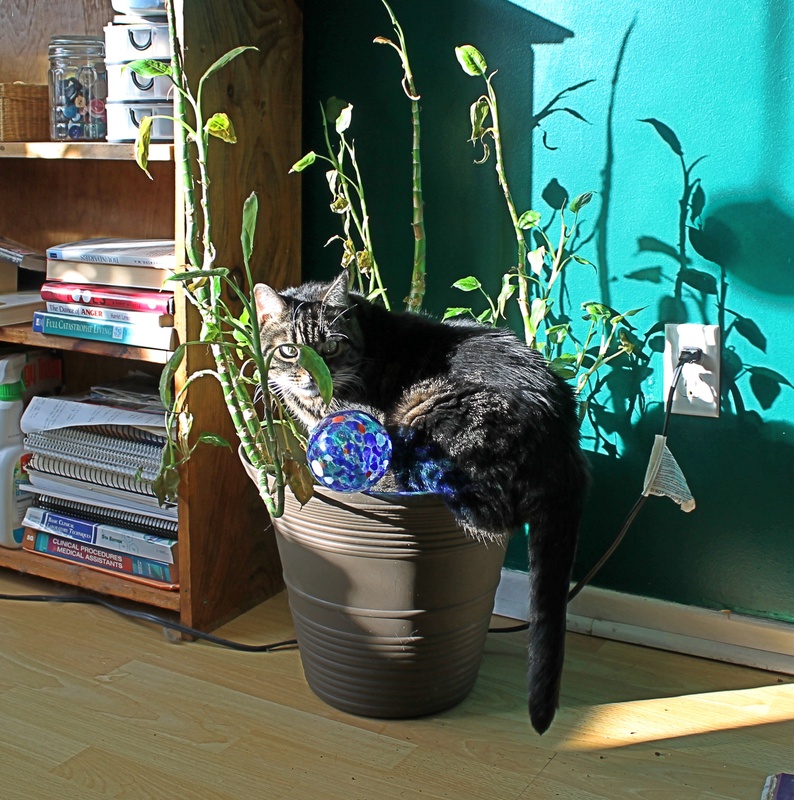 As far as plant care goes, it needs something to climb on. I guess I’ll have to get a moss stick or some sort of trellis. It is sensitive to cold as well as extreme light or heat. If you’re growing yours on the windowsill like me, you should be fine. Just watch out for cold drafts in the winter. If you get any flowers, expect them to bloom at night. I don’t know how large the plant needs to grow before it starts producing fruit; I may not get any at all in my climate. If anyone has experience growing dragon fruits, feel free to share your story in the comment section! You can/ and need to germinate some seeds in the fridge? never knew this! (shows that a terrible gardener I am). Don’t dates grow on date palms? I don’t think I can grow *that* on my living room window sill 🙂 The dragonfruit seed planting sounds interesting though, I might try that, thanks for the tips on getting that started. Haha. Yeah, certain seeds won’t germinate unless they think it is spring. Putting them in the fridge tricks them into thinking it is winter. Then when you take them out, they’ll start growing. The dragonfruit is easy to grow. I usually kill cacti, but these ones are still going!